This is a bit of my history in the Protestant Church. I hope you find it enjoyable. I was baptized as a child in the Congregational church before joining the Presbyterian in my early-thirties. I was initially drawn to Presbyterianism for reasons of theonomic or Bible Law government, but while a Boy Scout the presbyterians sponsored my troop whereupon I also received my first study Bible. My experience after that largely had to do with confessional presbyterianism as defined by the Westminister Confession. Presbyterian Shock. Fording across River Thames was not so much a repudiation of Presbyterianism as it was the Solemn League and Covenant (SLC). Nonetheless, it was a slow rowing trip before I hit the shores of continuing Anglicanism. The Solemn League was a military-religious pact between Scottish and English Presbyterians justifying rebellion against ‘disciplinarian’ Bishops in the CoE. Signed by Puritans to extirpate so-called “dregs of papacy”, the Long Parliament called the Westminster Assembly to refine the terms of SLC. This assembly produced a new settlement exclusive to Presbyterianism, known by the Westminster Confession (WCF) as well as its Directory of Worship. The WCF not only lacked royal authority proper to English law, but it contained points of faith or doctrine (RPW) contrary to scripture. The scriptural problems in the WCF led me to take a ‘step-back’ to the earlier church; hence, my eventual return to Anglicanism or the “Protestant Reformed Church of England”. Consistent treatment of the RPW left Presbyterian worship intellectually untenable. Furthermore, the introduction of extemporaneous prayer often times felt frivolous, carelessly said, and, sometimes, even “politically correct”. These concerns persuaded me to seek out the safety of fixed prayer in the BCP, greatly framed to the mind of 16th century divinity. Coming to Terms. All this confirmed the problematic legacy of the Puritan and Parliamentary struggle of the 1640′s, culminating in Cromwell’s Interregnum. Despite the period’s tragic aspect, there is much about Puritanism that I still admire, namely, its emphasis on regular catechism, expository sermons, and a firm historic identity held by Presbyterian clergy and lay-people. I also remain fond of the Puritanical quest for holy life exemplified by Christ’s humiliation. The seriousness of Puritanism is remembered as ‘dark’, as if the Puritan divines purposely extended Lent through the whole of the Christian year, making every Holy Day a Good Friday. If there’s such a thing as Puritan ritual, then perhaps a perpetual low-mass or even an eternal requiem as descriptive? Rather than reject this legacy in toto, I’ve come to view Puritanism as a laudable aspect of Anglican spirituality, a legitimate daughter of the mother church, having pre-reformation and even monastic precedents. The deeply penitential character of Puritanism arguably has similarities to Franciscan or third-order devotion (which was a similar reaction against worldliness in the church), emphasizing the visible the mortification of Christ’s corporate body. The focus on a suffering body seems to have certain Christological peculiarities for the West? In this sense, Chalcedon might be a continued focal point for later monastic and evangelical revival in the Church—Puritianism and Methodism being examples with Protestant Monkery. Enter the Prayer Book. But my journey to Anglicanism was not entirely a negative reaction to the Solemn League. I was also drawn by the theological depth and historical richness of the prayer book. Not only did I find fixed-prayer wholesome, but the BCP’s occasional ordinances were also attractive. Unlike other Protestants churches, the conservative nature of English Reformation perhaps did more to retain the catholic past. England’s “conservative reformation” not only preserved an organic identity with the past, but it allowed our states of life– i.e., birth, marriage, and death– to become testimonies for Christ. 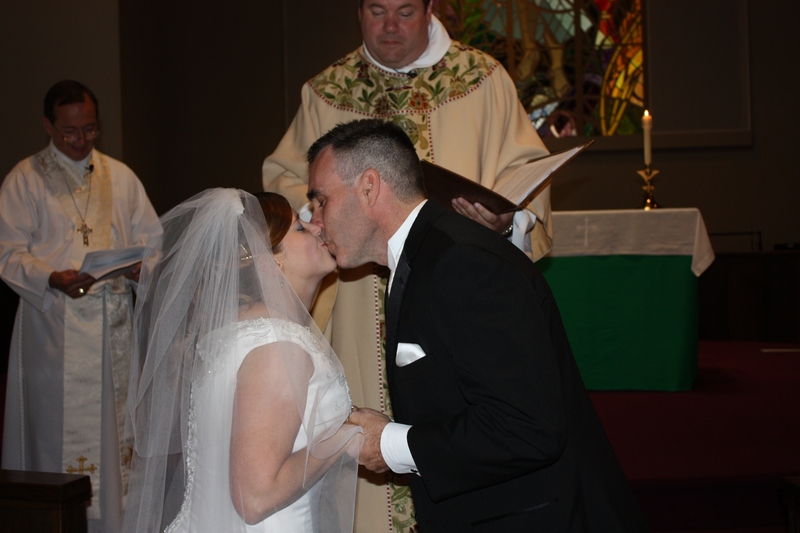 Where would we be in these junctures without the well-known words, “Dearly beloved we gather here today…” or “Ashes to Ashes, dust to dust…”?Among these testimonies, I wanted my future marriage to be a Christian witness, not just a ‘civil ceremony’. 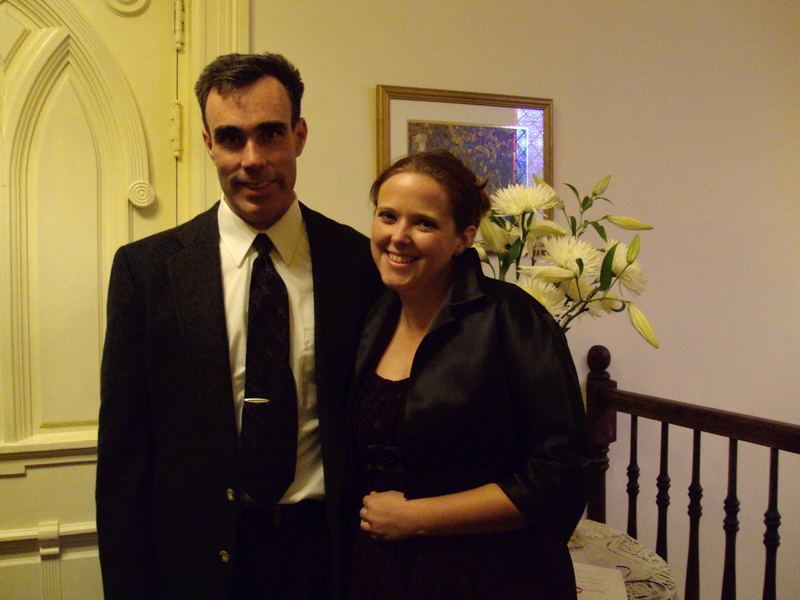 By the time I met my Bride, Ms. Amanda Kruse, I was already lapping the beauty of England’s historic common prayer book. 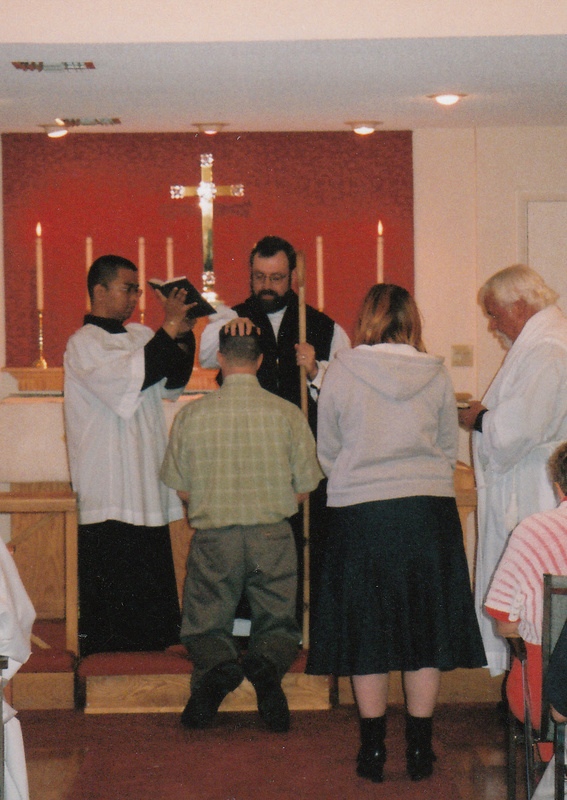 Before our marriage, Amanda and I were careful to be confirmed under an biblical-minded Bishop, so we presented ourselves for the laying on hands by the Most Reverend Peter Robinson of the UEC. On March 4, 2010 we were confirmed and became ‘members-at-large’. But confirmation also help prepare us for marriage which happened on August 14, 2010. Curiously, this was the same date as the Vigil of St. Mary’s Sleep. Perhaps coincidence? An Anglican Home. Upon the advice of Bishop Peter Robinson, we temporarily joined an REC/APA parish under Bishop Richard Boyce. This turned out quite ironic. James Jordan mentions both REC and UEC in the same breath as ‘orthodox bodies’ within modern Anglicanism (Sociology of the Church, p. 130). Bp. Boyce entered the REC on grounds of the APA’s Solemn Declaration, saying in his letter, “My group joined APA because it was open to Anglican unity. We need a united voice, a good seminary or two, a Christian education resource, a national magazine, a profile to help announce the Gospel to a needy nation. We need to be part of a world of inspiring orthodox Anglican leaders”. I continue to be persuaded by Bp. Boyce’s letter regarding cooperation among conservative Anglicans; however, my wife and I remained UECNA members despite attending other Anglican churches. We’ve never left Bp. Robinson since our confirmation, partly due to our endearment with him as a sort of “New Josiah” for continuing Protestant Episcopalians. We now have a UECNA prochapel with a handful of regular visitors as part of our private society, and three of our children have hence been baptized by a UECNA priest. Charles Bartlett currently lives in Northern California with his wife and five children. He is a certificated k-12 instructor, and UE lay-reader. So far, we seem to be 2 for 2 regarding Anglican converts on the beach. thanks. Good to hear from you, and let’s start brainstorming on other articles we can add. I am looking at some Compline prayers. One of the best ways to get me excited is to bring up the Office! Thanks for starting this. I am on my way to the party ASAP, Lord willing. The funny thing about Wesley, however, was how far he took ‘evangelical necessity’. I don’t see a definite break from the CofE until Methodists consecrated their own bishop. Wesley oscillated back and forth between high and low. Do you have any thoughts on a connexion of priests making a bishop? Do you think there are any justifiable arguments for ‘necessity’? By this time High Churchmen viewed episcopate succession more than convention but having gospel foundations. It was probably no coincidence that the first “Evangelical bishop” in the Church of England was also a high churchman. Now, if I may express my own opinion, any truly sound churchman must be evangelical. It is even more important that an Anglican priest or bishop must be Catholic at the altar and in quire and Evangelical in the pulpit. My own four principles which are probably not original but learned so early that I have forgotten the source are Catholic Faith, Orthodox worship, Apostolic order and Evangelical mission. A sound Anglican parish will have all four in balance if it simply uses the prayer book fully, i.e., does everything which is required by same in the manner (English Usage) intended. I also quite agree with Charles that Guy Fawkes day needs to be revived among us. I am sure that Anglo-papalists (not Anglo-Catholics) find the day embarassing because they tend to believe that Rome is the locus of all things truly Catholic – at least by their definition. And they would not want to offend those who in the past would be quite happy to see us destroyed and who, I am sure, have conspired with liberal secularists to the destruction of the Church of England and Anglicanism period, just as they did with the Puritans to bring Laud and Charles I to the block.